male labour supply | Utopia – you are standing in it! 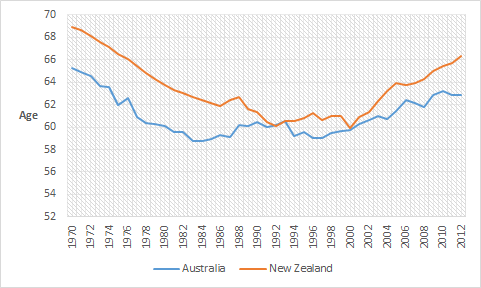 Figures 1 and 2 shows a sharp increase in the average effective retirement age for men and women in both Australia and New Zealand between 1970 and 1990. After that, retirement ages for men in both countries stabilised for about a decade. effective retirement age than Australia. Interestingly, in the 1970s and 1980s, New Zealand had an old-age pension scheme, known as New Zealand Superannuation, whose eligibility age was lowered from 65 to 60 in one shot in 1975. This old-age pension in New Zealand had no income test or assets test, but there was for a time a small surcharge on any income of pensioners. Nonetheless, New Zealand had a higher effective retirement age than in Australia where the old-age pension eligibility age is 65 with strict income and assets tests. Figure 1 and figure 2 also shows that the sharp increase in effective retirement ages in New Zealand for both men and women after the eligibility age for New Zealand’s old-age pension was increased from 60 to 65 over 10 years. 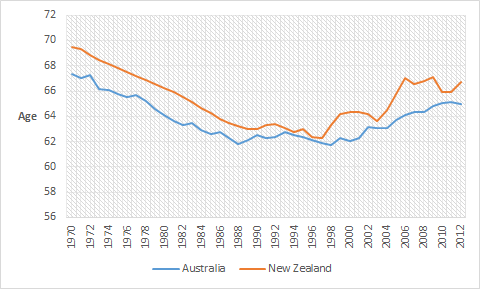 Figures 1 and 2 also show the gradual increase in effective retirement ages for Australian men and women from the end of the 1990s. This entry was posted in economic history, labour economics, labour supply, politics - Australia, politics - New Zealand and tagged ageing society, Australia, demographic crisis, economics of retirement, effective retirement ages, female labour force participation, female labour supply, male labour force participation, male labour supply, old age pensions, older workers, retirement ages, social insurance, Social Security, welfare state on July 24, 2015 by Jim Rose. 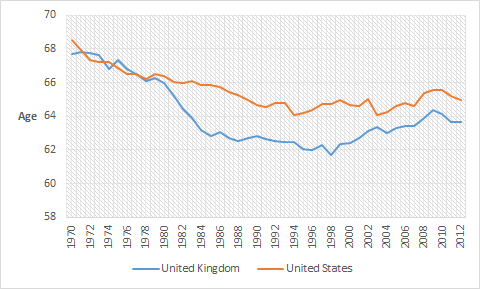 Figure 1 shows a divergence in the 1970s where there is a sharp increase in the average effective retirement age for men in the UK over a short decade. 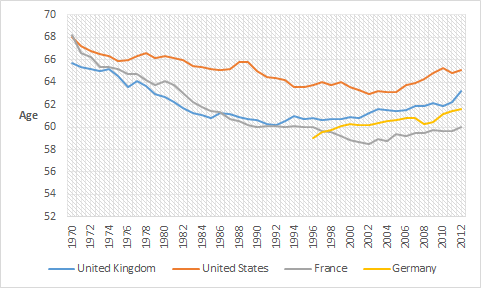 After that, British retirement ages for men started to climb again in the late 1990s. 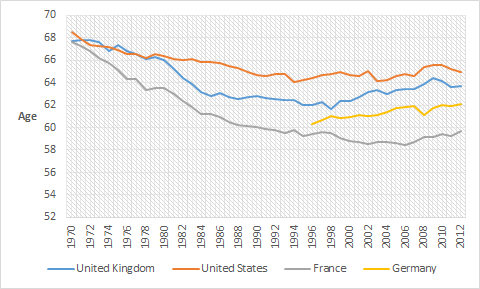 Figure 1 also shows that the gentle taper in the effective retirement age for American men stopped at the 1980s and started to climb again in the 2000s. Figure 2 shows similar results to figure 1 for British and American women. 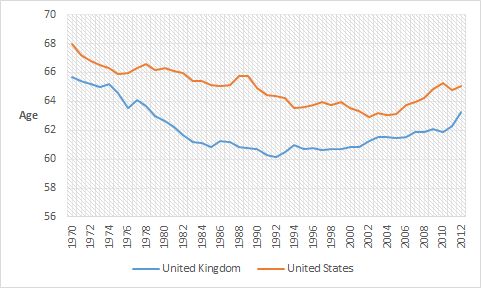 That is, falling effective retirement ages for both British and American women in the 1970s and 1980s followed by a slow climb again during the 1990s. 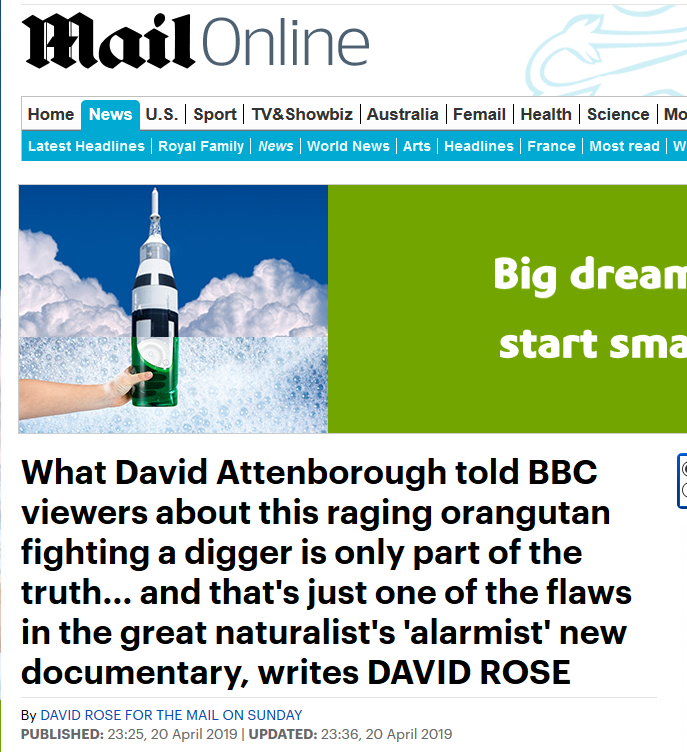 This entry was posted in economic history, gender, labour economics, labour supply and tagged ageing society, British economy, demographic crisis, economics of retirement, effective retirement ages, female labour force participation, female labour supply, male labour force participation, male labour supply, old age pensions, older workers, retirement ages, social insurance, Social Security, welfare state on July 23, 2015 by Jim Rose.